What does zero emissions mean and what are the challenges? While zero emissions sounds like a simple concept it's actually a pretty tricky discussion with lots of different terms being used for an array of reasons. As with many things the devil is in the details. The simplest technical thing to keep in mind is that not all emissions are equal. In the conversation about greenhouse gases (which are the emissions we want to have become neutral) we have to understand a concept of CO2 equivalent. What this means is that there are multiple gases that contribute to global warming (i.e. greenhouse gases or GHGs). They are all called CO2e because everything is compared to CO2 in terms of it's impact on the greenhouse gas effect. If CO2 effects the greenhouse gas as a 1 (since it's the baseline) then methane would effect it at about a 25 and nitrous oxide at 298. The relevance for this discussion is that as things like the tundra thaw and release massive amounts of methane (from decaying organic matter) it can have a 25 times greater effect than the equivalent amount of CO2 from a car or the heating of a home. As already discussed in the first 2 parts, the City of Vancouver's Zero Emissions Plan has a three pronged approach to get to zero emissions. District energy, a switch to electricity for heating and changing the sustainable building standard from LEED to a building envelope focused standard called Passive House. In part 1 we covered how the LEED standard was responsible for a 30% emissions reduction since 2007, and in part 2 we covered how district energy was supposed to make up a good portion of the 70% the city is short for zero emissions. In part 2 we focused only on the technical and regulatory challenges with district energy but didn't cover the full lifecycle GHG impact of a biomass or other organic matter district energy system. The biggest flaw with the City of Vancouver's general idea of using biomass (wood waste or other) as a carbon neutral heating source (whether in a building boiler or a district energy system) is that it's not very carbon neutral. "we found that if you harvest wood for energy, whether it be for fire prevention or simply for energy itself, the emissions associated with these activities are more than the savings that you get by substituting for fossil fuels." While this may seem a little counter-intuitive it makes sense with the new science we know about how a forest sequesters and holds carbon. In general we now understand how it's not really the wood from the tree that holds and helps with carbon reduction but the overall health of the forest itself. Surprisingly most of the carbon in a forest is in the roots and soil, meaning the overall health of the forest is what holds the carbon in place. If we start to mess with that natural state we really mess with the amount of carbon the forest holds. The other big part of the problem is that wood is not a very good energy source and the City of Vancouver just doesn't have enough to use for heating. First you have to send a diesel truck to get the wood (someday though these could be electric, but that's not always GHG neutral...see below), then you need to process it and then you need to dry it so it will burn. All in all you may be using more energy to do this than the energy that is in the wood itself. Electric in Vancouver has a GHG footprint of about 11 metric tonnes per GWh. For context natural is 180 tonnes per GWh. While our electricity is clean relative to natural gas BC Hydro (despite the name) is not a completely hydro electric based utility. It has natural gas plants within it's portfolio and will buy from other fossil fuel sourced electrical providers during peak electrical demand periods. It's also worth noting that the 11 metric tonne number is not without controversy. While the BC Government consider large scale hydro electricity as carbon neutral there are many that think it may have a much larger impact. One such organization is the Center for Resource Solutions who administer the Green-e standard for carbon neutral energy. The biggest reason is that the reservoirs from large scale hydro can be a significant source of GHGs. While this is certainly a greater problem in a tropical environment, BC as a boreal rainforest environment isn't a different as we'd like to believe. There is also the environmental impact of flooding an entire river valley and eliminating the forests within them, the natural spawning of fish etc etc. 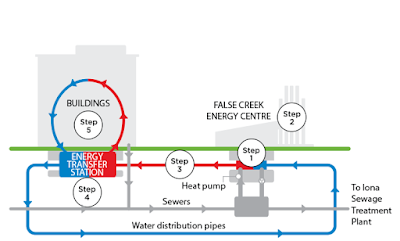 The City of Vancouver's Southeast False Creek (SEFC) Neighbourhood Energy Utility sits at the bottom of a very large hill where much of the sewage flows towards a treatment centre on the North Shore. A cleverly placed heat pump (one of the largest in the world) sits under the Cambie Street bridge very intelligently grabbing the waste heat and transferring it (not very intelligently) 3 blocks away to the Olympic Village. 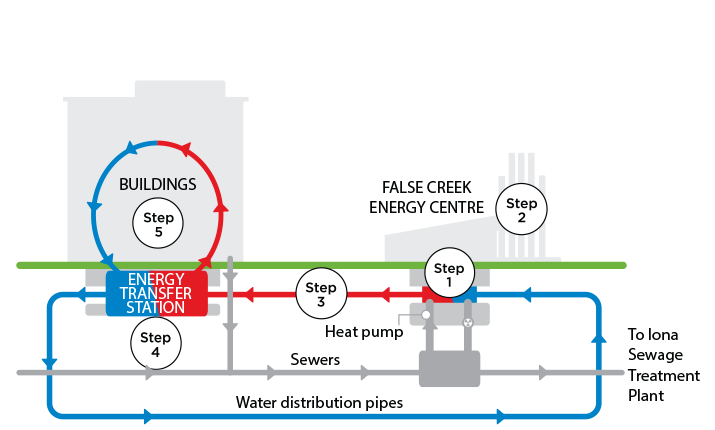 By the City's own estimates the heating centre is about 65 metric tonnes per GWh. While this is better than natural gas it's not a good as electricity in BC. Although it might be equal if we accounted for hydro dam reservoir emissions. By the City's own numbers 30% of the heating load from the SEFC Neighbourhood Energy Utility is from natural. The City hopes to add closer and further away residential developments to the utility. The biggest question for facilities more than 3 blocks away is whether the same metric tonne value per GWh actually makes sense. For example there are potential plans to connect develops close to 2 kilometers away near the BCIT Great Northern Way campus. That's a long way from the current source of heat. The best sources of zero emissions energy, solar and wind technology are completely absent from the discussions within the City of Vancouver's Zero Emissions Plan. 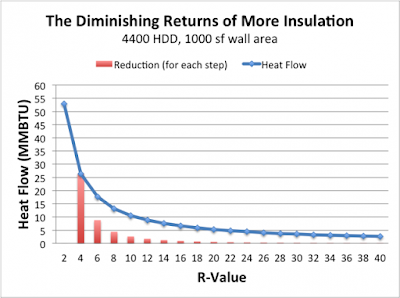 Other systems such as air source heat pumps are also not part of the discussion. An air source heat pump has a Coefficient of Performance (COP) of 2.8. COP is this amazing thing where you take 1 unit of energy (in the case of air source heat pumps its electricity) and you get 2.8 units of heating out of it. If that electrical energy were from wind or solar we'd truly be able to have a conversation around a true net zero emissions plan.